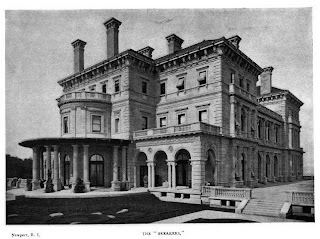 'The Breakers', the Cornelius Vanderbilt II estate designed by Richard Morris Hunt c. 1893 in Newport, Rhode Island. Vanderbilt was the eldest son of Commodore Vanderbilt's eldest son William Henry Vanderbilt. 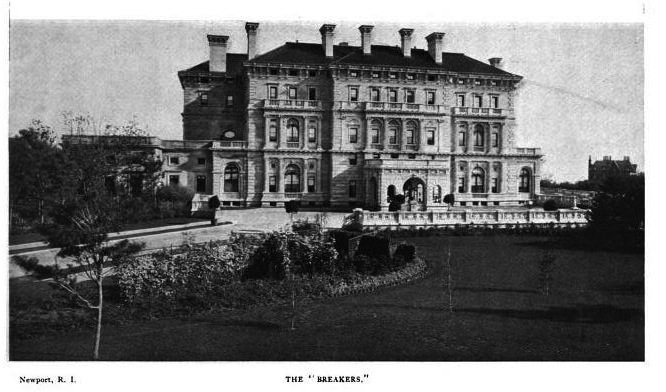 C.V. II built 'The Breakers' on the site of Pierre Lorillard IV's residence of the same name which burned in 1892. 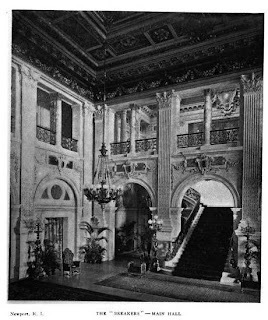 Following C.V. II's death in 1899 the house passed to his widow Alice Gwynne Vanderbilt and following her death in 1934 to their daughter Countess Gladys Szechenyi. 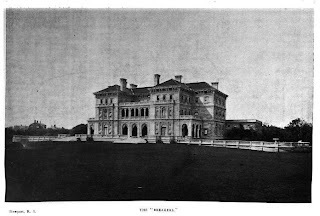 The Preservation Society of Newport County began leasing the house in 1948 and purchased it in 1972. 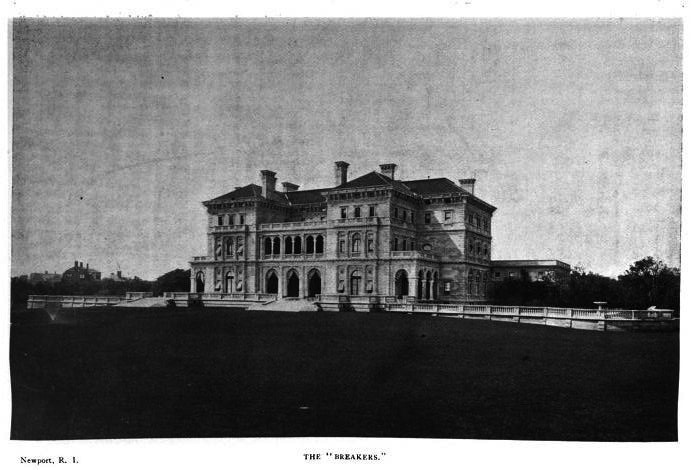 Click HERE for more on 'The Breakers'. Click HERE to see the estate on google earth and HERE on bing. Photos from Architectural Record, 1895. I'm a bit surprised by the lack of comments on this post. Maybe everyone else's reaction was the same as mine. I look at the gilded opulence in just the dining room, and in addition to almost getting a headache, I'm left with the question "what's the point of all this?". I wonder if the chairs lined up around the periphery of the room were for the rabble invited in off the streets to watch "de rich white folk eat stake 'n lobsta"
Oh what a great way to end the day. Hunt more than succeeded in creating one of the most amazing Gilded Age mansions of its era and certainly cemented William and Alice as the king and queen of Newport society. As an opulent stage set to host elaborate banquets, dances and recitals nothing comes as close to perfection as The Breakers. 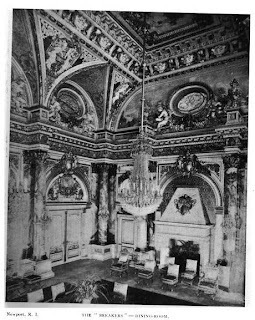 Indeed, anonymous, your question is the one everyone should have when viewing The Breakers---'what is the point of all of this'---though the answer is self evident: 'See how rich we are, we are richer than Croesus, and we tower over our neighbors (never was a house more out of scale with its neighborhood), we tower over you all". of course it's wrong, but the end product still amazes, and it is an idea carried to its full limit. The skill in planning and execution behind this Brobdingnagian vulgarity is unmatched, so one is constantly left with conflicting feelings about it. With The Breakers, whether it is right or wrong is so beside the point. It just is. 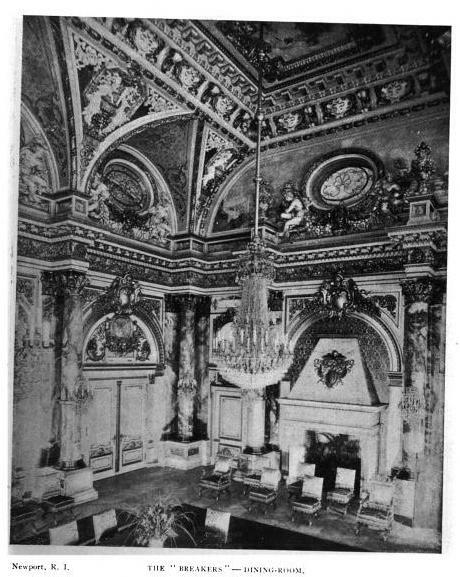 PS Anon---for me, the moment that you had comes not while viewing the movie-palace decor of the dining room, but in the upper loggia (bottom picture--magnificently executed, superbly crafted, and as unpleasant and cold a place to spend a summer afternoon by the sea as can be imagined---one that no amount of potted palms and wicker chairs can make comfortable. 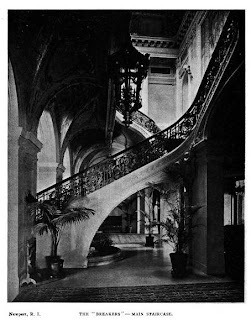 One wanders through the family apartments on the second floor--all very handsome, and again, that sealed-up feeling---they might as well be in the Faubourg St. Honore, or on Park Avenue, or in Buenos Aires. 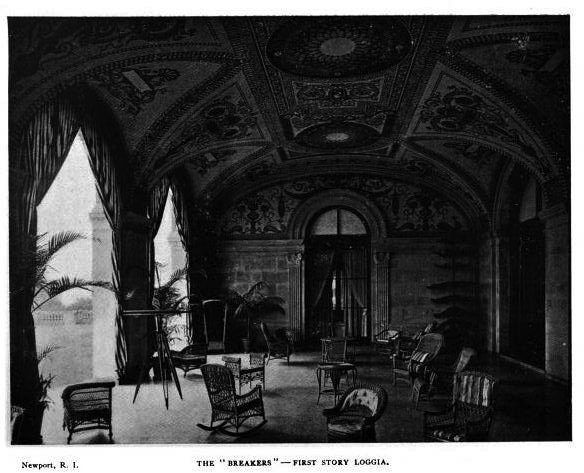 On the other hand, when one enters through the series of vestibules, ascending upward, through ever larger and higher passages, and thence into the great hall (with a moment of the bends, having come up too fast to this moment), with its wall of glass open to the sea, and its almost Piranesian sense of endless vista through columns and arches, you are rewarded, gratuitous marble and gilt aside, with the work of an architect who knew how to manipulate space and effect. and all framed with richly veined marble. Faux, of course, but the COLORS ~ they dazzle ! The senses are not spared ! "See how rich we are, we are richer than Croesus, and we tower over our neighbors"
That's the motivation behind all this display? It's hard to imagine that kind of singular drive. The design phase must have been lengthy, the actual building and furnishing processes lengthier still. 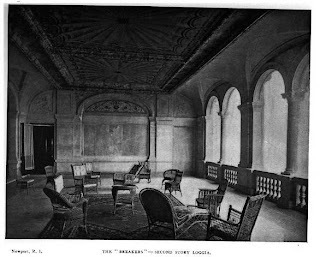 Checking around for some dates and found that CVII suffered a stroke at age 50, one year after the "cottage" was completed. 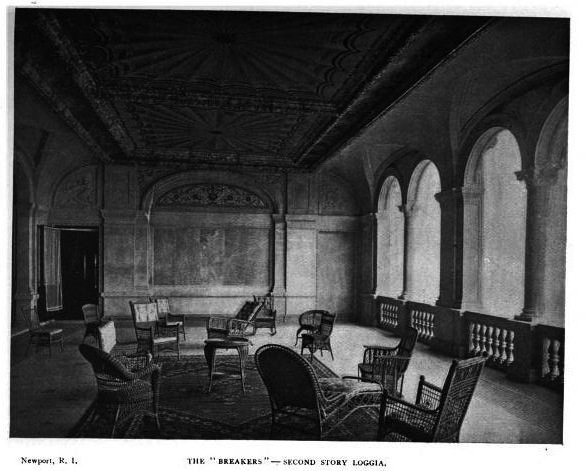 I had the same reaction as you with respect to the loggia. 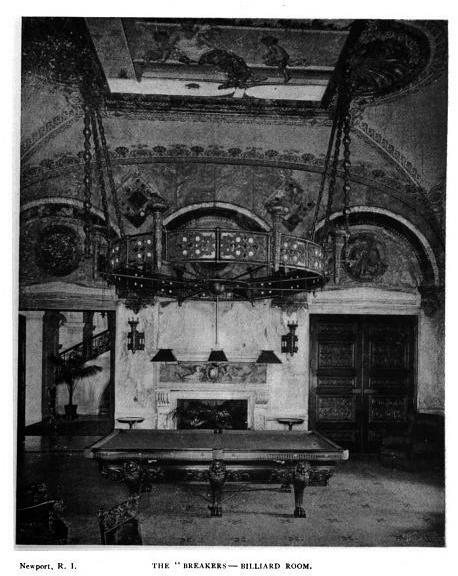 It's just the unbridled excesses in the dining room that screamed at me to comment on. It is indeed a superbly designed and crafted piece of construction, but man, does it ever turn me off. I wouldn't want to live in that thing. I'll gladly take a siesta on the loggia anyday. I might not mind kitchen duty either after viewing the link. This past winter on an unusually warm sunny afternoon the semi-enclosed loggia was idyllic even during off season. 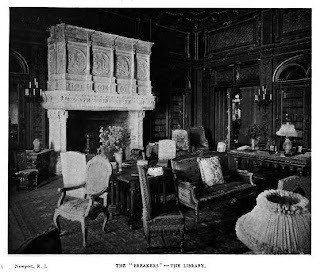 There appeared to always be a gentle rivalry within the Vanderbilt family regarding their numerous building projects. Although I'm sure Alva would have you convinced that she was the unspoken clan leader, seems Alice Vanderbilt had the mindset to maintain her rank and status as the families social head. 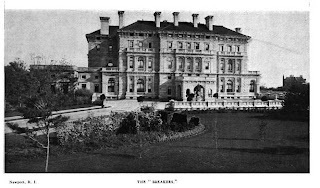 She firmly ensured that position when The Breakers opened for the season a few years after Marble House had opened to much heralded fanfare. I've been on that Loggia many times, in beautiful weather and foul---and while it impresses me, fascinates me, and is gorgeously executed, it is not inviting. I've spent my afternoon on a series of grand old shingled verandas today, and no comparison. 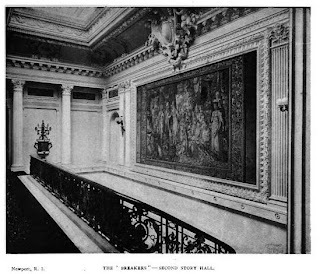 Flo, re the design process: It all went extraordinarily fast---Hunt and his draftsmen went through their schemes, and the whole affair was ready in under two years from the fire that burned the first. Astonishing, no? "the whole affair was ready in under two years from the fire that burned the first. Astonishing, no?" In ignorance, I look at a "house" like this -- given the times, the location, the detail, the available resources, the specified materials, relative sophistication of contracts -- I obviously miscalculate that bringing something like this from the ground up must have been like building the Pyramids. Flo, I overfloored you. 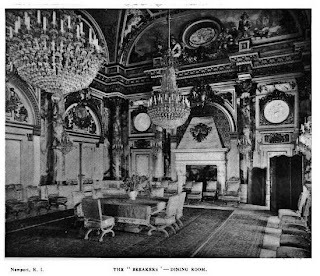 I misspoke, and the new Breakers was finished not in just UNDER two years, but just OVER two years---still absolutely astonishing. Remember---a great deal was contracted out---Ogden Codman designed the bedrooms, Richard Van der Bouyens did the Music Room, which was constructed in France, etc etc---and if you've ever seen the construction photos---well, there was a workman pretty much every two feet...still astonishing, even if I was off by a few months.